Tabletop game design isn’t an expensive hobby to begin. All you need is a pencil and some paper to start. However as your designs get more and more complicated, other necessities get added to your list. Common items include Dice, Index Cards, Card Sleeves, etc. You want to have enough tools to make your design iterations as fast and as painless as possible so you can focus on designing instead of prototyping (I discussed more on that in a previous post the “Rule of the Loop“). My newest addition to my kit is a godsend. I can’t even imagine making games now without it. Behold! The Frixion Pen! What is the Frixion Pen? The Frixion Pen is a pen with ERASABLE INK. You heard that right. At first I was skeptical. Back when I was in grade school, I remember buying erasable ink pens. They came with rubber erasers and were erased with a pencil eraser. The problem with those pens was that they could never be fully erased. I remember rubbing the paper so raw it would tear before the ink would really be removed. 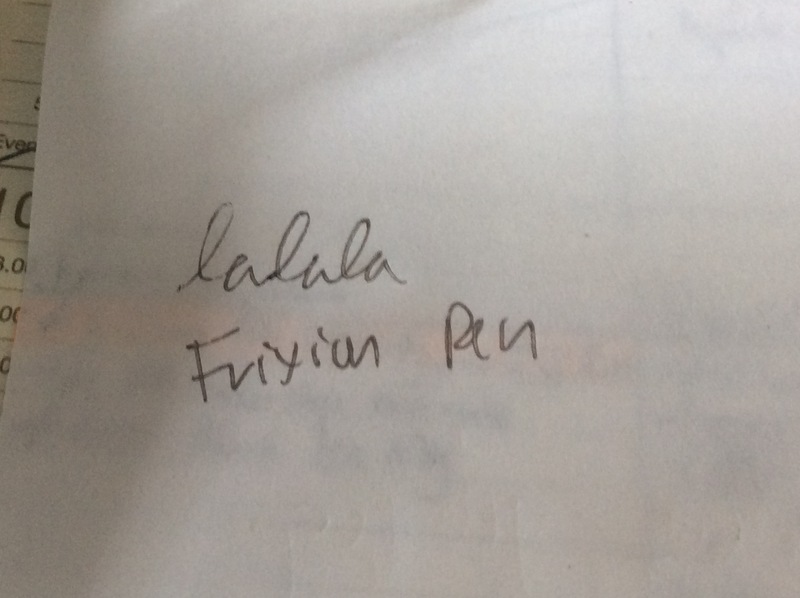 The secret to magical erasability of the Frixion Pen is that the ink is not erased; it is just made to disappear. According to wiki, heat turns the ink transparent. When you rub it with the eraser, you are actually heating the ink to make it disappear instead of rubbing it out. Amazing! Because heat is the trick, the eraser on the back of the pen is actually not a typical eraser. It’s more of just a hard piece of rubber which is good because it doesn’t wear out as quick. If you’ve designed games, you’d immediately get how cool this new pen is. Throughout your iterations, you will be making changes to the stats, names, abilities, etc of your game components. With Frixion, you can make all these changes on the fly which considerably lessens the time between iterations. Now, you might be thinking: “Why not just use a pencil?” You can but here are the reasons why I prefer using a Frixion Pen. No need to bring a sharpener around with you. The Frixion Pen will always stay in a comfortable writing length unlike pencils which become little stubs in no time. It will always stay sharp. As I already mentioned, the eraser is a hard piece of rubber that doesn’t wear out as fast as a typical eraser so you don’t have to pack an extra. Since the eraser is tough, it won’t break away or crumble. Erasing is also more accurate because a pencil eraser will take a blunt shape after use. I don’t know if it’s just my imagination but I think Frixion erases cleaner and with less effort than a pencil. Since it’s ink, its lines are darker than a pencil which is really important when testing prototypes with friends who need to clearly see your interface. Pens have caps or are clickers. Most pencils don’t have a cap so they are hard to bring around in your pocket. A pen is neither pointy or will it snap in your pocket. The Frixion Pen has eliminated my need for using pencils and all their paraphernalia like sharpeners and erasers. However, let me just say that replacing your pencils for Frixion Pens is not for everyone. Frixion Pens are pens: they don’t have the same artistic use as a pencil. I’m not much of a draw-er so its fine for me but if you are a doodler, you might want to try it out first and see which you prefer. I need different colors for prototyping because they help me design the interface of my game ideas. I often need to make it clear to the players the distinctions between different words, symbols, and texts in a game. Printing is not a viable option early in the development cycle since you’re going to be making a lot of changes in your game; a lot of them on the fly. Colored pencils work but one gripe I have with colored pencils is that they are hard to cleanly erase. (Unless I just don’t know where to buy the good stuff). Frixion comes in many different colors which suits my needs. Aside from the typical black, blue, and red, there is also orange, green, purple, and pink. Well, those are the colors I’ve seen and I wouldn’t be surprised if there were more. For the moment, black, blue, and red suffice my needs. If I need more, I’ll know where to find them. I’ve been using my black Frixion Pen heavily for maybe 2-3 weeks now and the eraser is still pretty solid. As you can see in the picture, the old eraser has tapered off in the edges but it is still intact- unlike a pencil’s which would have torn off by now (or been chewed off). The rubber is really hard and I think it will survive several refills. Frixion Point: Seem to be like gel pens. Have the most colors from what I’ve seen. Frixion Ball: A ballpen instead of a gel pen. Frixion Clicker Ball: Ballpen clicker version. This is what I personally like since I don’t like carrying caps. The ones I bought have a 0.5 pt but there are thicker ones. I didn’t buy since I don’t have the need for them yet. Though I haven’t seen any yet, according to their website it seems there are even highlighter Frixion Pens. Wew. I bought my Frixion Ball Clickers for P79. I know, they are kinda expensive. To mitigate the cost, I only use them when prototyping. For all my other writing needs, I stick to my trusty My-Gel. The Frixion Points are a little bit cheaper. If I remember right, they are P72 each. Another great thing is you can buy refills. I bought a 0.5 Black Ball refill for P44. Also, the refills of the Ball and Point are interchangeable: you can use a Point refill on a Ball ballpen. (I think as long as the pt size is the same.) This means you can actually just get one pen and buy the different refill colors you’ll need. I don’t know though how easy it is easy to find refills for the uncommon colors. So far I actually haven’t changed the refill of the Black one I’ve been using for Trese Casefiles. I don’t know if one refill really lasts so long or I’ve just been very frugal with it’s use.